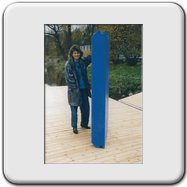 Since 20 years we supply and install modular floats for rowing. 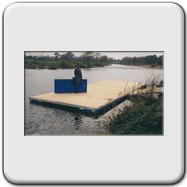 We offer complete installations as well as all elements you may require to build or to renovate your own float. 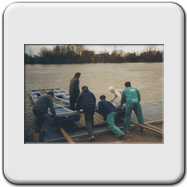 A good number of our customers have installed their float by a day´s work with own members, assisted by us. 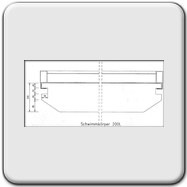 Solidity: Galvanized and reinforced steel-frame with up to 12 segments with heavy duty channels on the outsides for the reinforcement. Modularity: Quick and easy to modify and relocate. The freeboard of the float could be lowered/ lifted by removing/ adding of pontoons per segment. 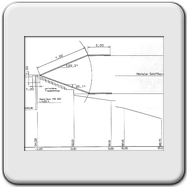 Segments could be handled in most cases without use of a crane. 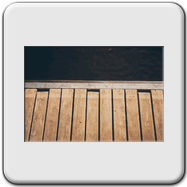 Decking: Treated norwegian spruce, pressure-locked gratings or forge-welded gratings. B-fenders with upper lip at the outer decking help protecting the riggers from damages. 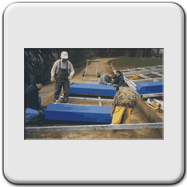 Durability: No-maintenance polyetylene pontoons with expanded polyethylene core and galvanized steel construction gurantee many years of trouble free use. 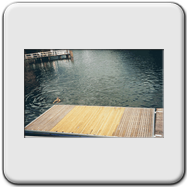 Without load the steel construction is completely over the water surface, only the pontoons are approx. 0,10 m in the water. 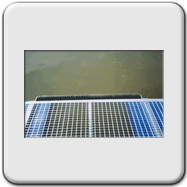 Gangways are available from 2 to 10 meters in length and up to 2,5 m in width. 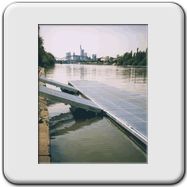 They can be supplied with hinges on both ends to allow a fix connection between the float and the embankment by variable water levels. Aside that the ends of our gangways towards the embankment could be fitted out with rollers or landing skids. For further informations please use our contact-form.